If you’re like us, when someone suggests dinner in Astoria, Queens, you think of a giant whole grilled fish, lemon potatoes and spanakopita. But, as it turns out, one of the best restaurants in Astoria serves food from a country 3,600 miles from Greece: India. 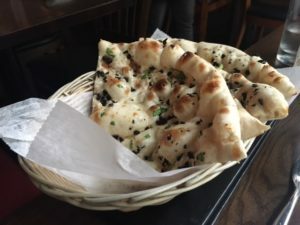 Kurry Qulture, the brainchild of owner Sonny Solomon and executive chef Binder Saini, offers a refined dining experience in an open, relaxed atmosphere, set in from Astoria’s bustling 30th Avenue. Among its more distinctive features is its seasonal menu that features a fresh rotation of fare both familiar and surprising. 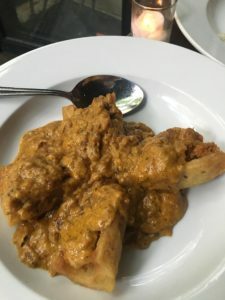 In the fall and winter, Kurry Qulture offers cuisine on the richer side, with heavier sauces, whole spices and liberal use of ghee, to keep the body warm. In spring and summer, the sauces are lighter and milder. 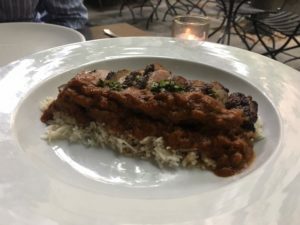 And by popular demand, about a fifth of the menu stays fixed year-round, so you can always order Kashmiri-style lamb, cauliflower florets, grilled prawns and sweet-and-sour baby eggplant, no matter the weather. Sonny treated us on a recent Saturday night to a tasting from his spring menu, and we were sufficiently wowed. This gem is definitely worth the trip from Manhattan (or Brooklyn, Jersey, Connecticut …). 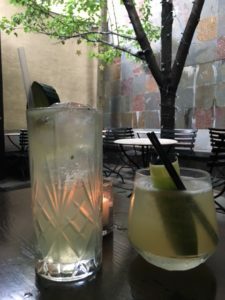 The drink menu offers a whimsically international, eclectic mix of cleverly named beverages, designed by mixologist Bo Dhale, formerly of Rosie O’Grady’s. 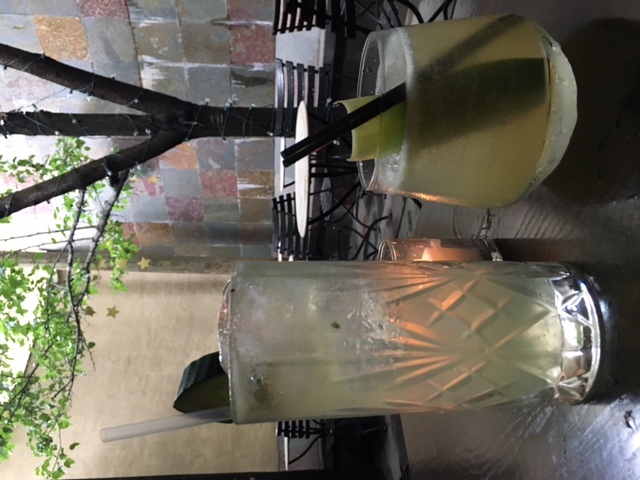 For round one, we sipped on the Hex-Mex, an intriguingly savory blend of Mezcal, homemade chili, pineapple syrup and lime, and the See Land Through Djinn, a refreshing and summer-appropriate potion of cilantro-infused gin, cucumber and tonic. For round two – ‘cause how could we not, with this selection? 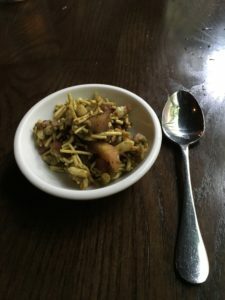 – we tried the Astoria of My Life, made form bourbon, sweet vermouth, thyme and figs, and our favorite, a peppy mixture of bourbon, ginger beer and fresh ginger called Diya. 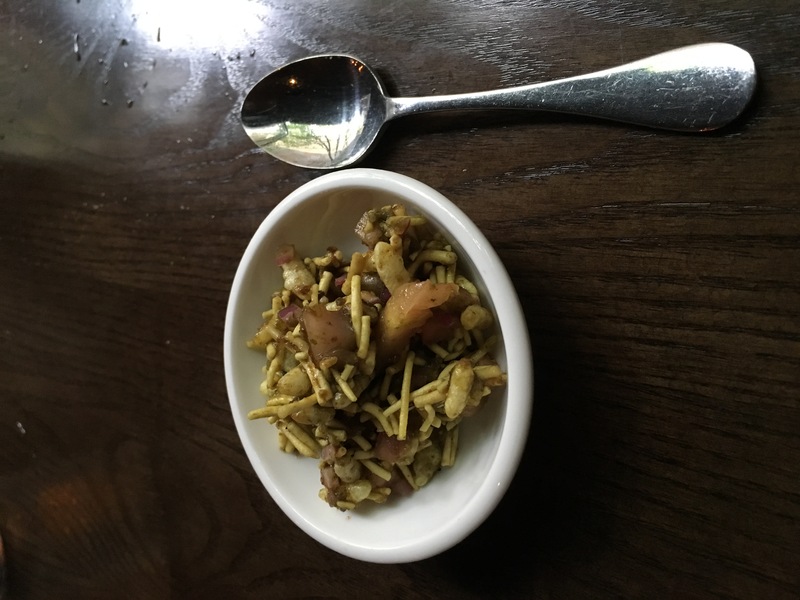 We began our meal with a cold, pickled amuse-bouche, followed by the coconut pepper shrimp with mustard seeds and curry leaves, a chicken kabob with spinach and coriander seeds, and the aforementioned cauliflower florets, garnished with homemade garlic tomato chutney. Of these, our favorite was the shrimp – perfectly cooked and flavorful, but not drowning in sauce. Kurry Qulture offers a wide spectrum of vegetarian fare, including vegetable fritters, lentils, saag paneer and beet carrot kofta. We tried the dum aloo, potatoes with a mixed vegetable stuffing. For the meat-lover, the menu features items you’d expect to see – homestyle curry, chicken tikka masala, chicken vindaloo – as well as those that perhaps you wouldn’t, including tandoori salmon served with lemon rice and green mango chutney, shrimp milee with mustard seeds, and tandoor grilled lamp chops with apple chutney. We tried the duck Bihari, which was served with cumin rice and tomato gravy, and the lamb chettinad, decorated with poppy seeds and the slight sweetness of shredded coconut. All this came with olive and garlic naan that was heavenly, prompting us to ask why anyone would want to eat naan any other way! The atmosphere at Kurry Qulture has a relaxed romanticism, and a decidedly modern sheen. This is not the type of Indian restaurant some folks are used to, with affordable lunch specials, linoleum tabletops and a blaring sitar soundtrack. 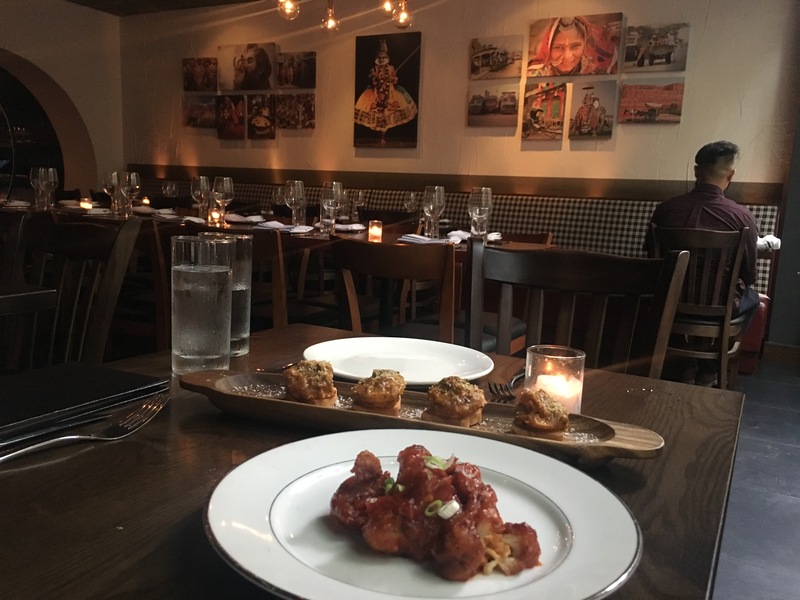 Kurry Qulture’s soundtrack is Pop and Bollywood, to showcase a side of Indian culture that mirrors the food – vibrant, youthful, fun. And the look of the place – the paint, the lights – was all Sonny’s doing, down to the distinctive artwork that comes from Sonny’s collections of 2,000 pictures. Choosing which ones to display, Sonny says, was the hardest part of doing the décor. The Kurry Qulture experience seems to appeal to patrons of all ethnicities. During our visit, we saw couples, families and friends of a wide range of roots, including younger guests of Indian descent, who may be more amenable to the dim lights and loud music than their grandmothers are. But, Sonny says, the best comments he gets are from matriarchs of Indian families. From 2004 to 2009, Sonny managed a restaurant off Union Square called Devi, the first Indian restaurant in North America to receive a Michelin Star. He then took his talents to Midtown to manage the elegant and still-operational Tulsi from 2010 to 2015. That restaurant, too, was awarded a Michelin Star. When Sonny opened Kurry Qulture in November 2015, he wanted to capture a more accessible, casual vibe, knowing full well that this probably would limit his chances of racking up Michelin Star No. 3. 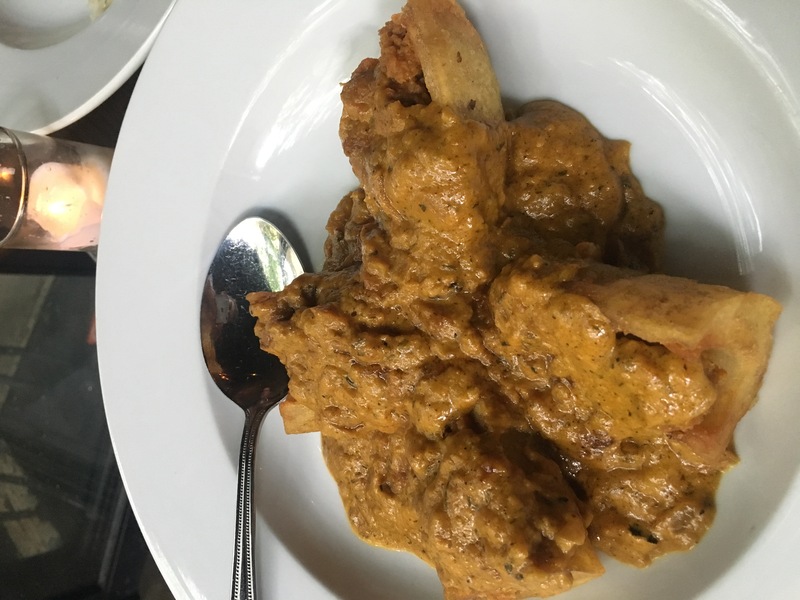 Although Kurry Qulture hasn’t received this recognition just yet – no surprise, since by restaurant standards it’s still in its infancy – it did receive a Michelin certification and was featured in its 2016 guide, which Sonny said stunned him.